so I just showed up, apron in tow. 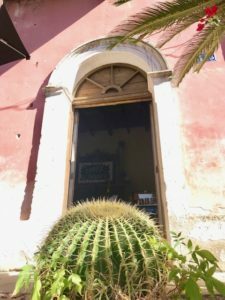 quaint little town of El Triunfo, Baja CA Sur. Marcus is a self taught baker & has baked every day for 21 years. 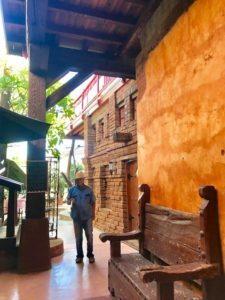 He even built his mesquite wood-fire ovens for his Caffe. 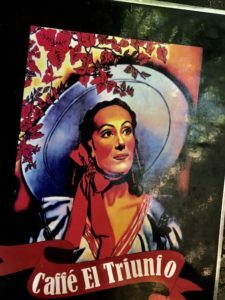 Before Caffe El Triunfo there was Caffe Todos Santos, over on the west coast of Baja. 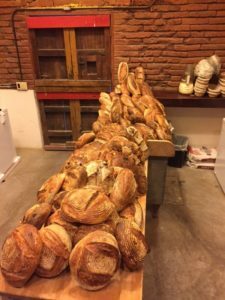 From start to finish Marcus’ bread fermentation process takes 24 hours to make. a natural sweetness & nut-like character. 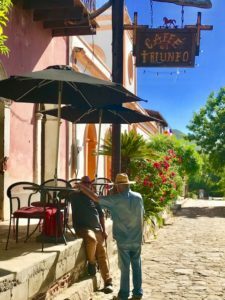 If you haven’t had the pleasure of a meal in his pizzeria or bakery, I highly recommend that you include an afternoon in El Triunfo for your next trip. & it shouldn’t be missed! Remove all stems. Wash Peppers with a vegie wash, rinse well and let drain well. Slice the Peppers into somewhat uniform 1/4 inch pieces, set aside. In a large pot, bring vinegar, sugar, and all spices to a boil. Reduce the heat and simmer for 5 minutes. Add the Peppers and simmer for 5 more minutes. Using a slotted spoon, transfer the Peppers into properly prepared sterilized jars. Fill up to 1/4″ of the jar rim. Once all the Pepper bits are removed from the pot and placed in jars, turn up the heat and bring the remaining liquid to a full rolling boil. Boil hard for 7 minutes. Use a ladle to pour the sugar syrup into the jars over the Peppers. Wipe the rims of the jars with a clean, damp towel, then apply the 2 piece lids. Save all left over syrup- it is so flavorful in Martini’s, marinate, etc. I recommend you do a hot water bath to properly and esthetically seal in flavor and out germs. If you use this right away, you can be more casual about the process by refrigerating the jars of Cowboy Relish. Place all ingredients in a bowl or plastic bag & let marinate overnight, or as little as 30 minutes. Seal the container to maintain flavors. I threw this together very quickly last night at an impromptu BBQ- It was amazing after only 20 minutes of marinating. That said, if you have time, put it all together and marinate overnight in the refrigerator. Drain off Peppers & liquid, setting aside for basting later. 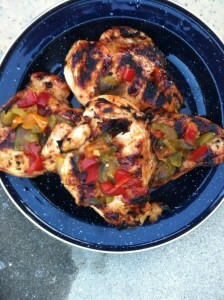 I move the chicken around on the grill a bit as I BBQ, making best use of the heat while not over cooking the meal. I paint the breasts with the marinate often and toward the end of the cooking process, I add the larger bits of Cowboy Relish, so they drizzle their flavor into the chicken, and also for their beautiful color. 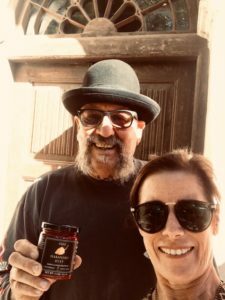 My friends Georgine and Jenn had a dinner party last night & I was asked to BBQ the fish & the Anaheim Peppers- As I do with many food items, I painted them up with Ojai Jalapeño Jelly, & everything was delicious! Let the fish marinate for a few hours. Drain off liquid, then BBQ over medium flame, turning often to cook evenly- Don’t dry the fish out. Paint fish with Ojai Jalapeño Jelly- flip then paint again. The Jelly will glaze beautifully, & seal in the flavors. You don’t need tartar sauce with this dish. I painted the Anaheim Peppers & BBQ’d them also- everything was tasty! ¡Vegan Sushi with a Savory Ojai Pepper Jelly/Peanut Dipping Sauce! Last night our “Valley of the Moon” aka ‘Ojai Valley Community Garden’ group met for our first ‘potluck’ dinner. It was well attended, full of delightful conversation(s), and we had lot’s of tasty foods to try. We met in the Keith’s Club House- Thank you Keith & Robin -again! Place all vegies in a bowl, large enough to toss as you would a salad. Add all but the cilantro and the nasturtium & toss. Next, run the rice paper under warm tap water until it changes from hard to mailable. Lay it on a very thin kitchen cloth (no fuzz), and lightly dab off the excess water. I then very lightly spray olive oil “Pam” on a olive serving tray to assist in forming the rolls- Lay the rice paper across the olive oil tray & push in the center, forming the cavity to fill with the vegetable mixture. The first item(s) I place on the rice paper are the nasturtium flower petals, & the cilantro leaf (this is the splash of color you’ll see best when the rolls are completed). Next add about 3 T. of the vegetable/rice mixture to the rice paper. Pull up ends of the rice paper, then one side at a time- all the while attempting to create a uniform sushi-looking roll. These wraps are translucent & make very pretty finger-food. Practice a bit and see if you can get them rolled long & lean, like a sushi roll; about 2″ wide by about 7″ long. Mix the peanut butter with the Ojai Pepper Jelly until you like the consistency, as well as the heat factor. It’s best to serve the sauce with a small serving spoon, so it can be dribbled on the roll. Often people like to add sauce as they go & we don’t want them double dipping now do we! Serve on a plain platter, so you can enjoy the natural colors of the ingredients. Place enough foil on a 2″ deep (or larger) baking dish to enclose the finished product (about 10″x10″). Drizzle with olive oil. Place the sliced onion on the foil- Use one set of rings for each halibut steak. Remove about 1″ of the center of each onion. Put a heaping Tablespoon of Ojai Organic Jalapeño Jelly in each ring center. Place the halibut on top of the onion. Sprinkle the capers, dill, salt & pepper on top of the Halibut. Place a 1/8″ lemon slice on each halibut steak. Drizzle with olive oil. Sprinkle about 2 T. grated cheese on top. Bring together sides of the foil & seal into a tent, leaving a small air space on top. Bake until the fish is white throughout- about 20-25 minutes. Unwrap. While it’s resting a moment freshen up the look by removing the cooked lemon slice. Place a lemon wedge on each plate & serve immediately. Sprinkle the yeast on top of the warm water. Let mixture rest until it’s frothy looking, then add buttermilk, butter, sugar, eggs, & 1 c. flour. Mix lightly & add the Jalapeños. Keep adding flour until 5-5 ½ c. are reached. Knead well. Place in pans & cover loosely with plastic wrap & a light towel. Let rise until doubled in size (about 45 minutes). Bake @ 350 oven for 25-30 minutes. Remove from pans & brush with butter. Serve brioche fresh from the oven with a side of Ojai Jalapeño Jelly & butter. Last week I was in San Francisco for the Fancy Food Show & I had the pleasure of an amazing evening & a lovely meal with friends at the infamous “Grand Cafe” on 501 Geary Street. I love APRICOTS-especially Mediterranean Dried Apricots. They’re not all dry & hard like most dried apricots~ they’re moist & supple. The other night I was craving something sweet. I was rummaging through the pantry only to discover we’d eaten all of the dark chocolate. That’s when I found the delicious treats. I diced a handful of Mediterranean Apricots and added them to about 4 ounces of Ojai Organic Jalapeño Jelly & it was fantastic! Try this with turkey, chicken, pork, PB&J’s, or with cream cheese on crackers. Not sure of what to make but want it to compliment your holiday meal in a hurry? Place the cranberries, fresh juice & cinnamon sticks in pan over medium heat. Stirring, heat only until the cranberries ‘pop‘, then set aside to cool slightly, drain off juice. Set aside cinnamon sticks for the serving dish. Add the cranberry mixture to a pretty serving bowl, add the Ojai Organic Jalapeño Jelly.